A flatfoot is a structural deformity of the foot in which the arch of the foot is functionally lower than normal. It is often referred to as Pes Valgo Planus. Flatfoot deformities are secondary to multiple problems and require careful clinical examination to determine appropriate treatment. The most common type is a flexible flatfoot. This could be seen in either younger children or the adult population. This foot type often results in arch pain, possible leg pain, as well as back pain. Flatfoot deformity also causes a significant amount of other foot problems, such as bunions, hammer toes and metatarsal problems. Heel pain (plantar fascitis) is not uncommon in flatfeet. Many patients with flatfeet also have Achilles tendon pain. This is secondary to the fact that many people with flatfeet have some degree of contracture of the Achilles tendon. Control of this type of problem is necessary to prevent the above-mentioned potential complications. Flexible pes valgo planus is most commonly seen in children, however, over the last few years a condition known as posterior tibial tendon dysfunction has been a concern to most foot and ankle surgeons. The posterior tibial tendon is a tendon that is on the inner side of the ankle and it helps support the arch. Oftentimes, either through repetitive cumulative trauma or possibly with an acute episode, this particular tendon can be either chronically or acutely injured. If this does occur its ability to hold the arch decreases, therefore, resulting in an obvious flattening of the arch of the foot and progressive flatfoot disorder. Rigid flat foot is as the name implies. It is a flat foot disorder that is defined by a foot that lacks normal flexibility. When one attempts to move the joint below the ankle on the affected foot the range of motion that exists on the rigid flat is significantly reduced. Some people may also experience tightening or spasm of the muscles and tendons extending into the ankle from the outer side of the leg. This condition is known as peroneal spasm. Rigid flatfoot deformities generally occur in one of two situations. In the young adult / usually in their 20s and 30s , it could occur as a result of a bony union occurring between two bones that generally are separate from one another. This merger of two bones to one another in the foot, specifically in the tarsal region of the foot, is referred to as tarsal coalition. The other reason for a rigid flat foot would be based on the development of degenerative osteoarthritis which is the normal wear and tear arthritis that occurs to a joint over a long period of time. A joint may become arthritic and limited with range of motion resulting in a flat foot also secondary to some previous traumatic episode, such as a fall that resulted in a fracture, possibly of the heel bone. Also, development of various metabolic arthritic problems, such as rheumatoid arthritis, can also lead to limitation of range of motion and thereby causing a rigid flat foot deformity to occur. It may seem obvious, however, it is important that you evaluate your shoes if you have flatfeet. A more supportive shoe with a good arch support can certainly provide some initial relief. Over the counter arch supports may be worth trying.Oftentimes treatment of a flexible flatfoot deformity may involve the use of orthotics that would provide some biomechanical control and support to this pronated foot In cases where discomfort occurs on the inner side of the ankle bone, the posterior tibial tendon would require more supportive assistance-ankle bracing. This condition, if left untreated can result in progressive deformity. At this point, in person professional medical attention is necessary. Professional consultation would involve; obtaining appropriate medical history, performing a physical examination including gait evaluation. Weight bearing x-rays will be necessary, and in some cases, MRIs or CAT scans may also be utilized. Initial conservative management may involve the use of an AFO, ankle foot orthotics. Either a professional grade foot and ankle support or a custom made device. Oral anti-inflammatory agents and further physical therapy may be necessary. If conservative therapy proves not to be beneficial then more definitive surgical intervention may be necessary. This may include the use of a combination procedures, depending upon the level of posterior tibial tendon dysfunction. This may involve exploration of the tendon with debridement of the tendon in its earliest forms. In the more common grade 2 level, posterior tibial tendon dysfunction is treated via osteotomy procedures. These procedures are extremely beneficial utilizing the most contemporary technology to realign the foot and rebalance the tendons on the inner side of the foot and ankle. Possible procedures that can be used may be performed in combination and include medial calcaneal displacement osteotomy with internal bone screw fixation, Evans calcaneal osteotomy with internal fixation, possible cotton osteotomy procedure of first metatarsal with internal fixation, flexor digitorum longus tendon transfer utilizing a tendinous screw and anchor, Achilles tendon lengthening and casting. In severe grade 3 abnormalities of the posterior tibial tendon where arthritic manifestations also exist then the patient may require a triple arthrodesis which involves resecting the articular surfaces and fusing them to one another in the joint below the ankle as well as realignment of the foot structure. These bones are held in place utilizing modern fixation techniques. This condition often requires in person professional attention. Professional consultation would involve; obtaining appropriate medical history, performing a physical examination including gait evaluation. Weight bearing x-rays will be necessary, and in some cases, MRIs or CAT scans may also be utilized. Depending upon the cause of the rigid flatfoot, treatment will vary. In the young adult with a tarsal coalition, initial treatment may consist of customized orthotic devices. Sometimes temporary casting will be used to reduce muscle spasm. However, if symptoms then continue, more definitive surgical methods will be utilized. This may consists of removal of the boney coalition between the actual joints together with repositioning techniques to aid in reconstruction of the foot. In more advanced cases, if degenerative processes have occurred, joint fusion techniques may prove necessary. In cases of arthritic rigid flatfoot deformities, initial conservative therapy would involve the use of customized orthotics, possible ankle foot orthotics, and oral or injectable anti-inflammatory agents. If these therapies are unsuccessful, then definitive surgical intervention generally consists of fusion procedures to the appropriate rear foot joints. 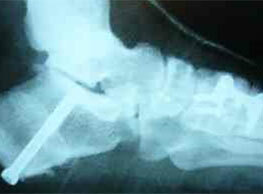 A common procedure is known as the triple arthrodesis, a photograph is shown above.